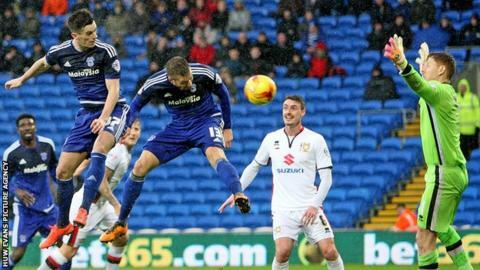 Cardiff City's play-off hopes suffered a setback after the hosts were held to a goalless draw by Championship strugglers MK Dons. Tom Lawrence hit the post with a header on his debut in a disappointing first half for Cardiff, who showed more urgency after the break. Lawrence and Anthony Pilkington had further chances but MK Dons held firm. Nicky Maynard wasted a good opportunity for the Dons, who are two points clear of the drop zone. Cardiff remain ninth in the table, five points off the final play-off spot. Heavy morning rain in south Wales had put the game in doubt, but the efforts of the Cardiff City Stadium ground staff ensured the match kicked off. Wales striker Lawrence, signed on loan from Leicester City started while fellow loanee Kenneth Zohore started on the bench. Dons' new signing Alex Revell was forced to wait for his debut as his contract stipulated he could not face his former club. Karl Robinson: Dons boss on Cardiff draw. The first half had been a scrappy affair with few chances for either side until Lawrence's glancing header struck the post. Cardiff finished the first half strongly with David Martin palming away Stuart O'Keefe's header and Peter Whittingham firing over the crossbar. Martin again denied O'Keefe early in the second half and the Dons keeper tipped Scott Malone's effort over the bar. Lawrence and Pilkington went close for the home side, who were much improved in the second half. Former Cardiff City striker Maynard should have given MK Dons the lead, but he fired over after getting the better of Matthew Connolly. Dons top-scorer Josh Murphy's blocked effort fell kindly for Darren Potter, but the midfielder shot wide. Bruno Manga headed wide from a corner while at the other end David Marshall, who had little to do all afternoon, made a full length save to deny Jake Forster-Caskey late on. "We know we still have a good chance of reaching the top six. "We have lost goals from the team with players being out injured and leaving the club, so we are looking at the players coming in to get them for us. "We did more than enough to get the three points, but we couldn't quite do it." "We should have had a penalty for a foul on Josh Murphy and I'm sure when the ref sees it again he will agree with me. "We rode our luck a bit at times and David Martin made some outstanding saves, but I'm proud of the boys. "It's our eighth clean sheet of the season and is a performance we can really build on." Match ends, Cardiff City 0, MK Dons 0. Second Half ends, Cardiff City 0, MK Dons 0. Attempt missed. Joe Walsh (MK Dons) header from the centre of the box is close, but misses to the left. Assisted by Josh Murphy with a cross following a corner. Corner, MK Dons. Conceded by Bruno Ecuele Manga. Attempt blocked. Jake Forster-Caskey (MK Dons) left footed shot from outside the box is blocked. Attempt blocked. Josh Murphy (MK Dons) right footed shot from the left side of the box is blocked. Assisted by Dean Lewington. Attempt blocked. Scott Malone (Cardiff City) right footed shot from the centre of the box is blocked. Assisted by Tom Lawrence. Corner, Cardiff City. Conceded by George Baldock. Attempt blocked. Tom Lawrence (Cardiff City) right footed shot from the right side of the box is blocked. Assisted by Federico Macheda. Attempt saved. Jake Forster-Caskey (MK Dons) left footed shot from outside the box is saved in the bottom left corner. Assisted by Jay Emmanuel-Thomas. Substitution, MK Dons. Dean Bowditch replaces Robert Hall. Hand ball by Darren Potter (MK Dons). Attempt saved. Joe Ralls (Cardiff City) left footed shot from outside the box is saved in the centre of the goal. Attempt missed. Bruno Ecuele Manga (Cardiff City) header from the centre of the box misses to the left. Assisted by Peter Whittingham with a cross following a corner. Corner, Cardiff City. Conceded by Kyle McFadzean. Attempt blocked. Anthony Pilkington (Cardiff City) left footed shot from the left side of the box is blocked. Assisted by Peter Whittingham. Attempt missed. Darren Potter (MK Dons) right footed shot from outside the box misses to the right. Attempt blocked. Josh Murphy (MK Dons) left footed shot from the left side of the box is blocked. Assisted by Robert Hall with a headed pass. Substitution, Cardiff City. Kenneth Zohore replaces Sammy Ameobi. Corner, MK Dons. Conceded by Sammy Ameobi. Foul by Jay Emmanuel-Thomas (MK Dons). Substitution, MK Dons. Jay Emmanuel-Thomas replaces Nicky Maynard. Attempt missed. Bruno Ecuele Manga (Cardiff City) header from the centre of the box is close, but misses to the left. Assisted by Peter Whittingham with a cross. Corner, Cardiff City. Conceded by Joe Walsh. Delay in match Tom Lawrence (Cardiff City) because of an injury. Offside, MK Dons. Joe Walsh tries a through ball, but Robert Hall is caught offside. Attempt missed. Nicky Maynard (MK Dons) right footed shot from the centre of the box is high and wide to the right. Assisted by Darren Potter. Attempt saved. Anthony Pilkington (Cardiff City) left footed shot from the centre of the box is saved in the bottom left corner. Assisted by Peter Whittingham with a cross.